If you have been following me, you know how much I enjoy Japanese anime and manga. There is one though that sticks with me that took on a strange concept that has left it banned in China and is getting school children suspended around the world. There has even been a death linked to it in Denmark. This story is called DEATHNOTE. 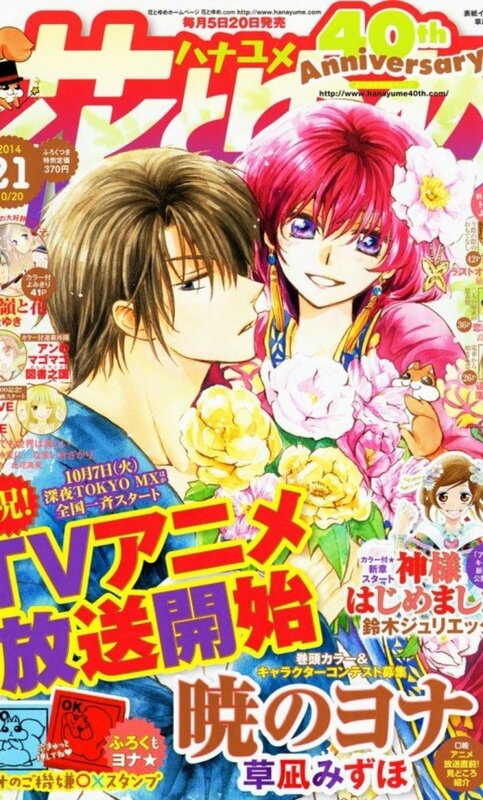 It is a best selling manga, a popular anime, and has spawned two movies, and a movie spin off. As i have stated before the Japanese creators tackle many subjects and weave a moral as none other can. 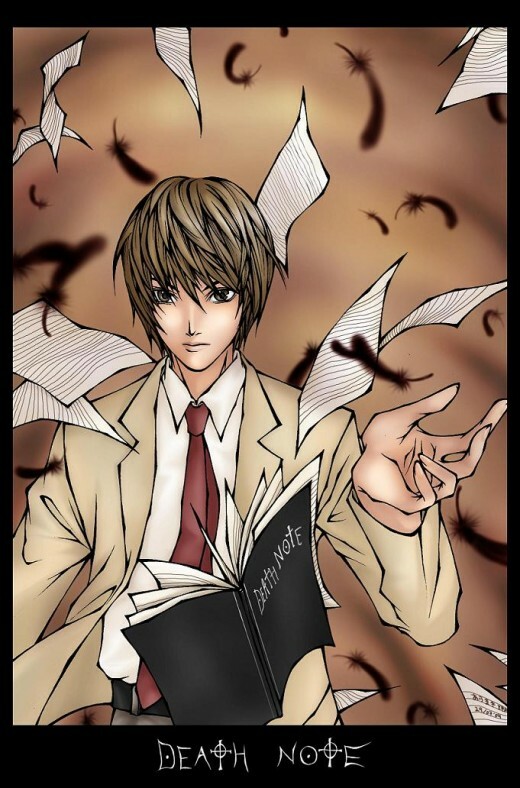 The premise of DEATHNOTE.... a college genius finds a notebook, called a deathnote. It has rules, but the main one is, write the name of the person in the book remembering their face and they will suffer a heartattack in forty seconds. Our genius, son of a policeman, studying law to follow his father's footsteps, has suffered from the lack of justice in this world he finds. Criminals are getting off... the police are seen as weak and useless... and there is no justice for the victims or their familes. 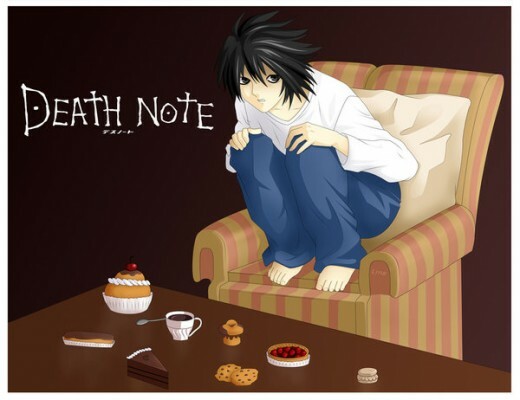 Hence, our young naive genius now posesses the deathnote. Will he use it? Does he understand the consequences of being judge and jury and executioner? Of course he does and he wields this power like none other can. As long as they are a criminal of a heinous crime, they should die. and Die they do. the villian, Light, and the hero, L.
L, young, a genius, loves sweets, has calculated that by sitting like this, he increases his brain power by another five %. 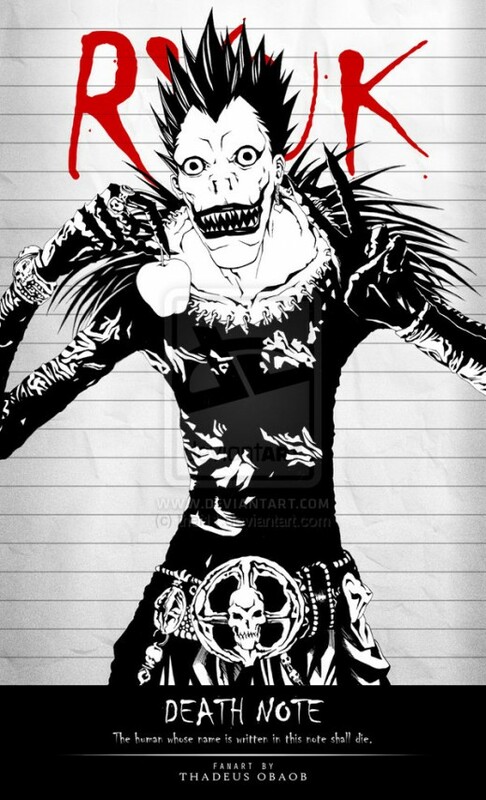 The oringinal owner of the deathnote is RYUK. A shinigami by trade, he gets bored one day with his eternal life and drops the notebook that is found by Light. The owner of the deathnote can now see shinigamis. RYUK reminds Light constantly that he is not a friend, but only wants to be entertained for a while. 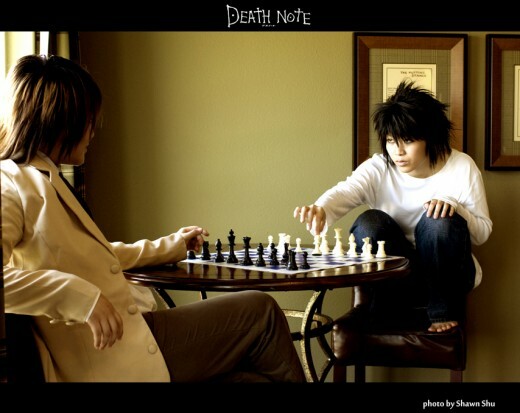 Thus a strange relationship is established and RYUK becomes the tutor of the student. 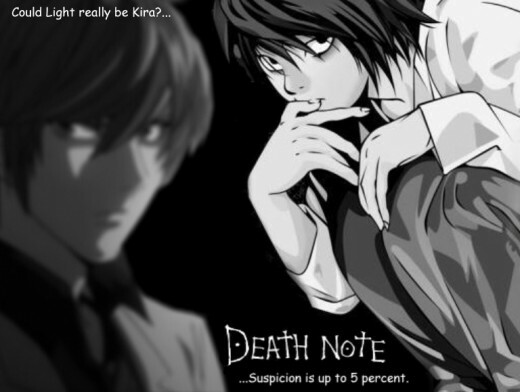 The public start to believe in KIRA (KIRA is the japanese pronouciation of the english word, KILLER). It is a pseudoname that Light uses to promote his unique form of justice. The police find themselves in a stranger situation. When the entire deathrow dies of heartattacks, the police have to protect the criminals.... interesting.... HUH? The situation becomes a world wide threat and L, a specialist in solving crimes is now assigned to head up the japanese task force, since he has profiled KIRA and knows he is in Japan. He establishes the general whereabouts of KIRA in Japan as he uses a death row criminal to impersonate him and announce a challenge to KIRA on Japanese television, only to have the man die of a heart attack. The show was actually limited to only one section of Japan, and L knows KIRA is located in that section. L, a genius who loves sweets and needs to sit in a chair with his feet up, is positive that Light is KIRA... he just can't seem to prove it, yet. Light, the purveyor of justice, is now forced to kill police. His sense of moral justice is broadened to killing whoever tries to stand in his way. After all, he is GOD. RYUK laughs and gently reminds Light he is killing his own. Light rationalizes that they should die for their beliefs in Justice. The CAT and MOUSE game is on. This is a hub suggested by Yiasa. She and I like the story for different reasons. As by my avatar, L is my hero. One who seeks the truth at all costs and is not that concerned as how he is percieved by others, he shines in his own way thru this story. Light shines also, but becomes a victim to his own ego. L as his antithesis makes the story. thankyou for reading this. I would love to hear your thoughts. take care. oh, please don't let me discourage you in any way. i will look forward to when you finish it and can tell me to read it as kinda a safe endorsement. kay? thanks for returning the comment though. i love talking with you about this stuff. checked out monster ACSutliff, i did start watching it before but stopped because it felt so hopeless.... um, forgot that i had watched some of it. i just need to get a little braver i guess. see, i still get mad when i remember how PAY It Forward ends... so kinda chicken really. hee. way cool. can't wait, thanks. hee. Monster is a huge anime. Look it up, it's amazing. thankyou for your kind comments. i do appreciate you stopping by. is monster a movie or anime? have not seen it. take care and thankyou again. Your summary of the show is just awesome. You give all the important points and make it sound just as awesome as it is without giving away too much. I also didn't know that they made deathnote notebooks. Of course kids would love to have a notebook that they could write names in, just for fun, but didn't anyone realize how serious that could be? It's probably good that they banned them, but going even further, they should probably not have made them in the first place. I mean, as unlikely as it seems, real criminals could actually use a deathnote as part of their twisted killing scheme (though that might help them get caught). This makes me think about Monster for some reason. Have you seen that show? I still have to finish watching it since it's so long, but I was just as intrigued by it as I was by Deathnote. lol kewl thanx. yea i hope he is ok.
rumor has it that the actor that played L is mia since the tsunami, i hope that is wrong, he stated that playing L was one of the hardest acting jobs he ever had in one of the interviews i saw. you can get a quick glimpse on you tube, just look up deathnote movie videos. pretty cool stuff. even better, i think, hee hee. not quite, but to answer that question would be giving up the entire ending. the first movie, L shows up probably about the last thirty or forty minutes or so, the second he is in all of it, there is also a spinoff called L saves or changes, can't remember which, the world which kinda finishes his story. hmm. so does L not die??? yea i dont think i watched it all, cuz i dont remember L in the movies im defintely gonna have to try and watch the one i have again. they have it in english dubs now, but it is hard to find. it ends differently from the manga and anime, here is the hint, near is not in the movies. thankyou. the ban is in some of the schools here in the states with a no tolerance to any kind of threat... um, but i appreciate your comments, that is the point of this story. and i thankyou. 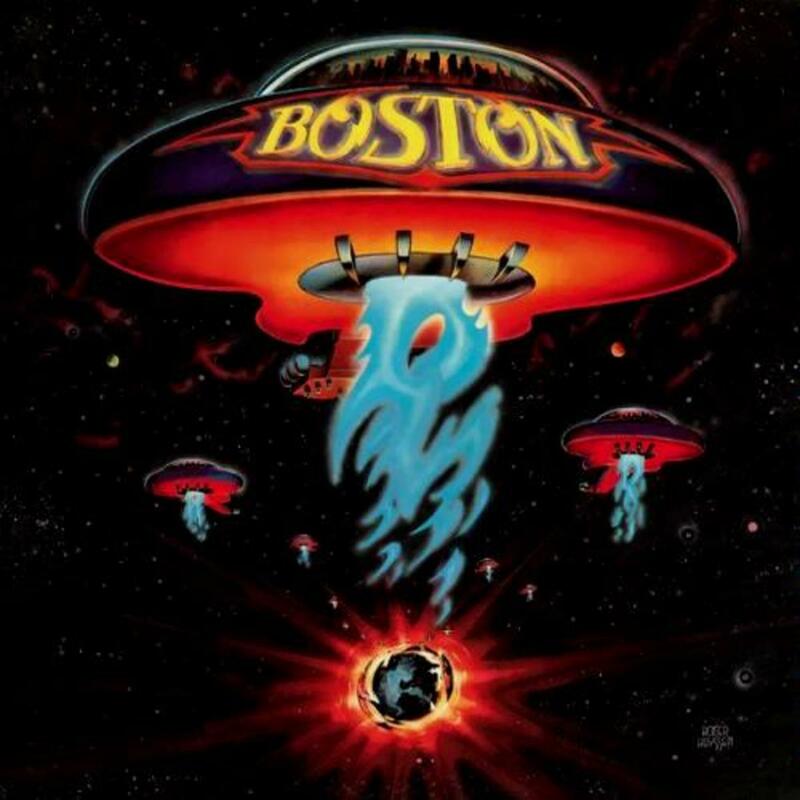 also there is going to be an american remake of this... hope we don't screw up the meaning. also, the japanese anime and manga end similar, but the current japanese movies that are out, end very differently. I watched the whole season of this recently. in english though but i didnt know that they actually had like "deathnote" note books in japan and that it was such a controversy over there. thats crazy, like any good tv series or movie, its gonna have merch. and this was a well known anime so of course its gonna have merch and people are gonna buy that merch. its not like we are gonna die by someone actually writing our name in this book. sure teachers and such might not like seeing there name written in a students book like that, but its more of just the kid being a kid. ugh i hate this teacher she should die. 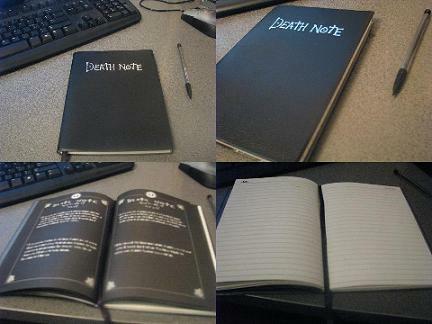 imma write her name in my "fake" deathnote..its purely as a joke. im sure he doesnt really want his teacher to die, its like when we say we hate our parents when they yell or punish us for something we seem unjust. we dont really hate them. he could write their names in the same book, its kinda like a hate book, that used to go around in schools, like in that movie Mean Girls. you write nasty stuff and rumors about people you dont like. i dont think its something to ban or take so seriously, but it can be hurtful, verbally. But i think kids should be taught how power, or how the want for power can take over like that, and that power isnt everything. and i think they can understand that from watching this anime series. light in the end meets his end. he let his power/ego get the best of him, and loses sight of what he was really trying to do...make the world a better place...he was more focused on... being a god. and creating his own world, for him to rule. eventually people would all be afraid of him, afraid to do anything wrong, afraid he would write there name down and kill them. which he basically would have been in full control, but killing is killing no matter how you put it. and he was killing even innocent people to keep himself from getting caught. i was so upset when L died, hes my favorite too. and light thought he had won, but true riteous always win. Mad and power hungry are not true riteous, those are the ones that would do anything, kill anyone that stood in their way, and thats not who i would want ruling my world, my country, you would still be living in fear.